Prepare to meet Snot! The star of the Smyths toys Christmas advert, this years most wanted toy! Snot’s story begins following as the toy that no-one wanted, a factory line error, cast out and alone, wandering the streets for a place to call home. Eventually Snot stumbles across Smyths toy store and saves the day when he topples a 50 foot dinosaur and is hailed a hero! 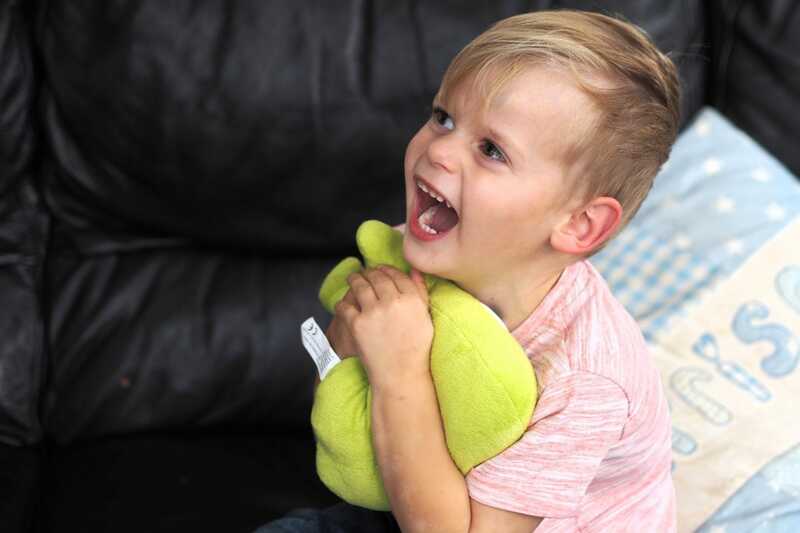 The children watched the advert for the first time this weekend and loved it, they thought it was hilarious that he was named Snot, I guess when you’re that age it is totally on their level! I love that the advert is voiced by David Walliams, one of my favourite comedians and authors. We were lucky to receive our very own Snot this week, and let me tell you that for a toy whom no-one wanted, he was very much wanted indeed!! He is super soft, super cute and super green! And Harry swooped in to claim him as his own, “That’s my snot!” he said. “He looks more like a Bob to me!” Megan said, which made us all laugh. My favourite thing about Snot, and I never thought I’d say that in a blog post, is that all profits will be going to Great Ormond Street Children’s Hospital. I cannot think of a more worthy cause and urge all of you to support them in buying your children Snot for Christmas. Seriously never thought I’d be writing that either….. Available now in Smyths stores priced at £9.99. I have been hearing lots about snot and was thinking of getting one for my nephew, the price is good and even better is the cause the funds will go to. Oh, this is wonderful! I love the look of Snot. Plus I adore David Walliams too. I’m sure Snot (or Bob!) will be a great hit this year. Caspian would go crazy for him as well. I’m reading alot about Snot ,he’s not that unpopular ! He is actually adorable. Your pictures capture the love for snot !!! 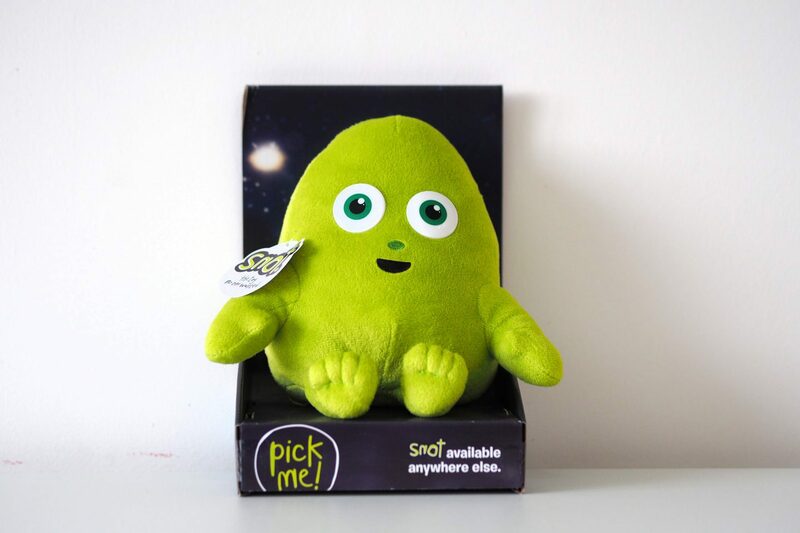 awww I’ve been hearing lots of great things about Snot… i think lots of little ones want him now. Aww what a cute toy. I love the name Snot. I bet my kids would love this toy. What a super looking toy and I absolutely love the name! My kids would LOVE this! Ah my girls have one of these, it’s for a brilliant cause and what a funny toy! Awww I love Snot’s story (a sentence I never thought I would say haha). And what a wonderful cause, plus he is sort of adorable. This is such a great idea- love that David Walliams on the ad. He’s awesome! It would never fail to be a winner with a name like that. My kids love all things gross! I didn’t hear about Snot but this is because I don’t have children. The idea of the ad is really nice and I love that it is narrated by David Walliams. He is such a great comedian! It’s great that all the profit goes to charity as well.